Tis the season for holiday baking, and I did just that this weekend! 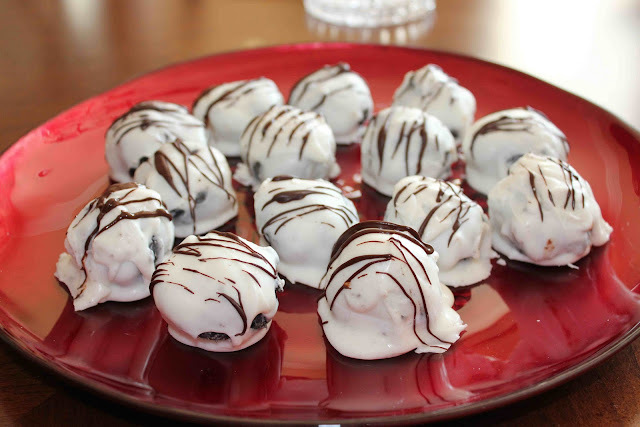 Tomorrow is our first annual Holiday Potluck at work, and I am bringing Quick Chicken Parmesan and a variety of desserts including Neiman Marcus chocolate chip cookies, fantasy fudge, candied pecans and these truly addicting white chocolate Oreo truffles. If you know me very well, you should know that I LOVE Oreos! I will only order ice cream, gelato and/or custard with Oreos. If I don’t get that flavor, I’m very upset. Don’t be fooled though, I may sample 3-4 flavors before ordering, but 99.999% of the time I will order cookies n’ cream. This truffle recipe did not disappoint. The only trouble I had was forming the balls. With only 1/2 cup of milk for a whole package of Jell-O and crushed Oreos, I found the batter was extremely thick. I had to add a little extra milk to help the truffles stay together and not crumble when rolling into balls. 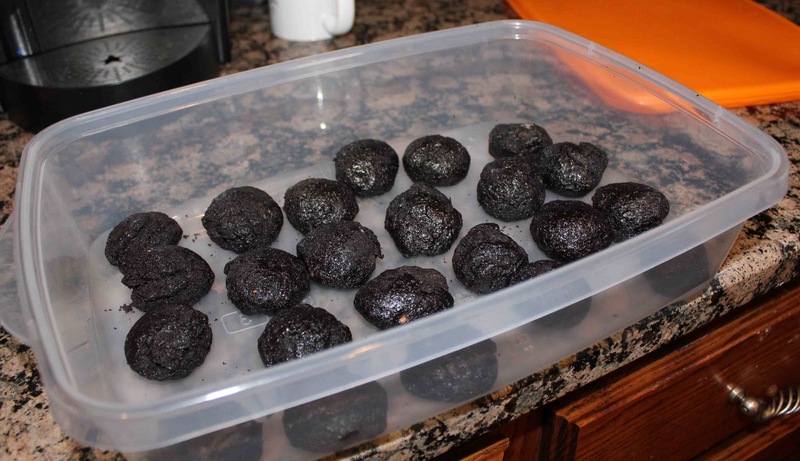 In addition, I had never made truffles before, so these definitely look “home-made”. They are not perfect little round balls. Instead, some truffles have more chocolate coating than others, some have too much chocolate drizzle, and some look lop-sided. I guess it gives them character, right? Plus, I think home-made truffles taste better than the boxed kind. My aunt Uny discovered this recipe and then shared it with my aunt Jolene, who shared it with me. Even though all three of us made the same truffle recipe over the weekend, we all had different results in terms of number of balls. I made 21 balls, Uny made 31 and Jolene made 49 balls! I guess it largely depends on how big you roll them. The original recipe calls for 42 truffles. Whisk together pudding mix and milk for 2 minutes. Add Oreo crumbs. Shape into one-inch balls. Place in the freezer for 10 minutes. Once balls are firm, dip them in melted white chocolate. Drizzle with melted semi-sweet chocolate. Enjoy and see if you can keep yourself from eating more than one! 1. 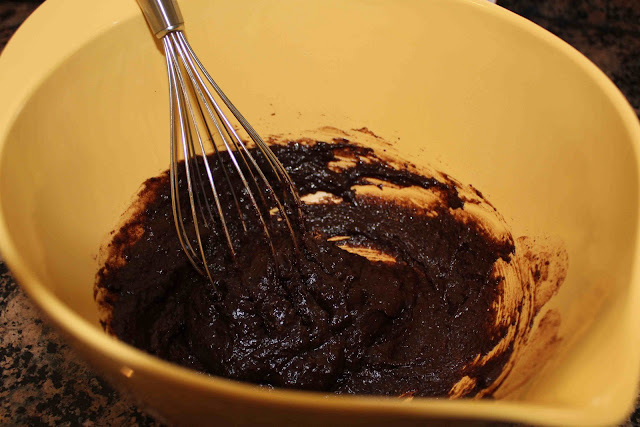 Beat pudding mix and milk for 2 minutes with a whisk (pudding will get thick). Add cookie crumbs and mix well. 2. Shape into 42 one-inch balls. Freeze the balls for 10 minutes. 3. Meanwhile, melt white chocolate according to package directions. I used the tray provided and melted the chocolate in a 250 degree oven for 12-15 minutes. 4. 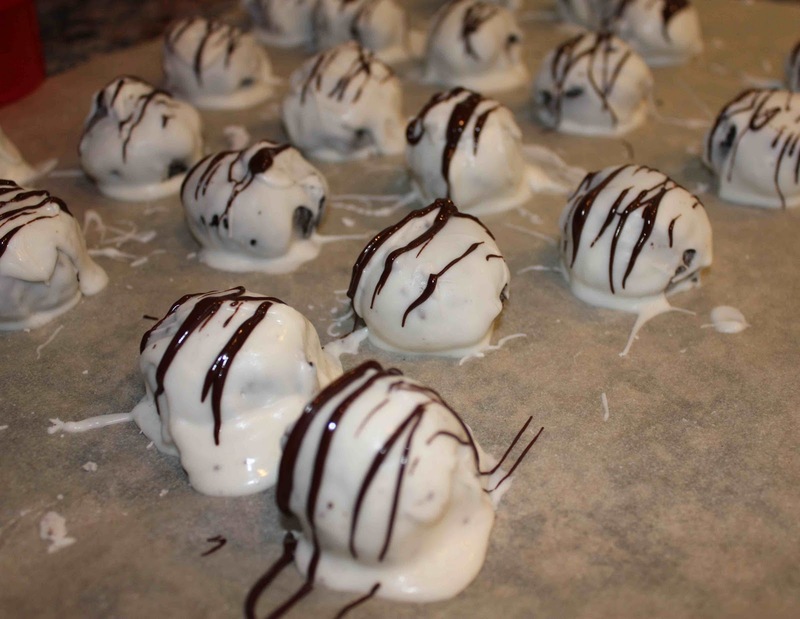 Dip balls into white chocolate and place in wax paper-lined pan. 5. Melt semi-sweet chocolate. I used the microwave, but be careful not to scorch the chocolate (use a very low-power setting). Drizzle truffles with semi-sweet chocolate. 6. Refrigerate balls until firm. 2 Responses to "White Chocolate Oreo Truffles"
Hi there! I have never seen the Oreo Truffles made with pudding. Interesting. Check it out if you get a chance? I might try your way next time! Hi! Yum! 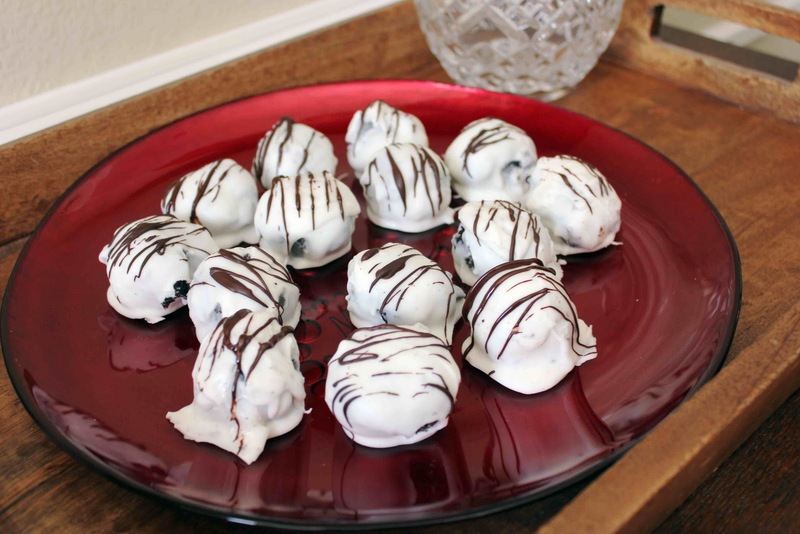 I’ve eaten cake balls with cream cheese and they are to die for! I changed it up here using pudding…slightly healthier when you use skim milk. 🙂 Do you have a link to the truffles you made? If so, I’ll be sure to check it out!